Domingo, Myrrh (2011) ‘Analyzing layering in textual design: a multimodal approach for examining cultural, linguistic, and social migrations in digital video’, International Journal of Social Research Methodology, 14: 3, 219 — 230. The template developed uses standard features of Microsoft Word such as tables, text boxes, image boxes, as well as color and font selection. Written words and still-shots from the selected video clips were inserted into the table to produce a multimodal transcription. I was interested in analyzing the distinct multimodal ensemble of the participants and in developing a representation of hybridity in their social language use as evident in their participatory textual designs. Developing the transcript provided a multimodal approach for analyzing the language variety of the diverse youth participants captured on video. 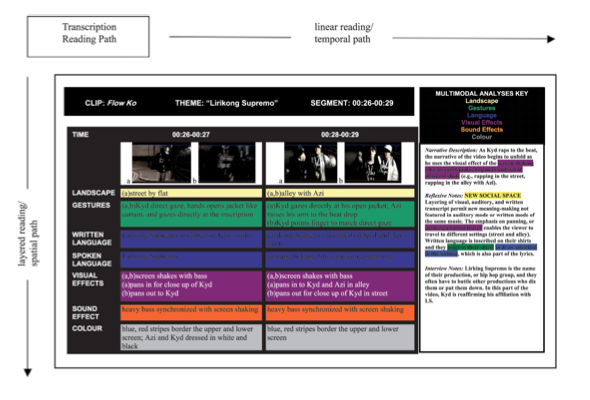 The transcript visually depicts their ‘linguistic layering’ using modes such as gestures, written language, spoken words, visual effects, sound effects and color selection. Among the challenges was to adapt the template in a way that would account for the temporal and spatial dimensions of video data. It had to visually capture how the multimodal ensemble comprised layered modes, inextricably designed to express a particular meaning for the participants.